Loose ends left loose for too long tend to strangle. Cole and Violet knew it wouldn’t be easy. They knew their relationship would take work. But when the press finds out about Violet Lynn’s newest boyfriend, they start digging. And when his past come to light, exposing all of his family’s secrets, their relationship begins to fray. Country Music’s Golden Boy, Jaxon Hunter, has it all, except the girl that got away. What she saw, she really didn’t. What she thought happened, he allowed her to believe for reasons so insane that no one would ever have believed him if he had confessed. But now that everything’s out in the open, he’s going to do his damndest to convince her that he’s the only one for her. Now Violet must choose between Jaxon— her first love and the guy she thought had cheated on her—and Cole—the guy who helped her heal and love again. Or will one of them make the decision for her? 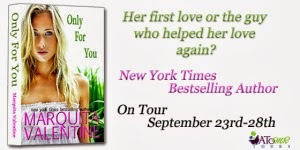 I really enjoyed Violet Rae and Cole's story in Live For You. Now I get to fall in love with Cole all over again in Only For You. Who wouldn't? Cole may be a bit rough around the edges but underneath he's a real man with a huge heart. The affection and care he displays for his sister only enforces my feelings for his character. Rae is also another character I can't help but like. Her secret is now out and she's back to performing. Anyone who's read the first book knows about her ex-boyfriend, Jaxon, her feelings for him, and the ultimate outcome. When this book begins, Vi is surprisingly, alone. What??? Where's Cole? She tells us in the prologue and I immediately felt sorry for....Cole. And Rae too. She's hurt Cole and wants to win his trust and get him back. But life throws her a curve ball when Jaxon, his girlfriend and her ex-best friend, Callie, and Rae's dad, a music producer, come to town for the fundraiser concert mentioned towards the end of Live For You. Instead of a one night performance, Rae is suddenly on a tour with all people, Jaxon. Of course, Callie accompanies Jaxon on the road (after all, she is his fiancee) and things begin to get dramatic and crazy. Jaxon isn't the jerk I thought he was and Rae has to search her heart for her true feelings. There's also a new cast of characters we get to meet (future stars of their own books in this series) as Rae embarks on the road trip of her life. I applaud author Marquita Valentine for giving readers the stories of both guys. I love Cole but in Only For You, I also develop strong feelings for Jaxon. This search--the pull and tug on her heart--which Rae undergoes is only natural in the progression of her career and her life. How can one think about the future when the past is still lurking around? I really liked Only For You. The drama, the searching, the music, and finding the true meaning of love only make me embrace this series even more. I loved Rae's decision and was glad at the outcome. And did I mention a terrific cast of secondary characters to like as well? Wonder who will star in the next book? Write faster, Ms. Valentine, write faster! Rating: 4 Really liked this one!